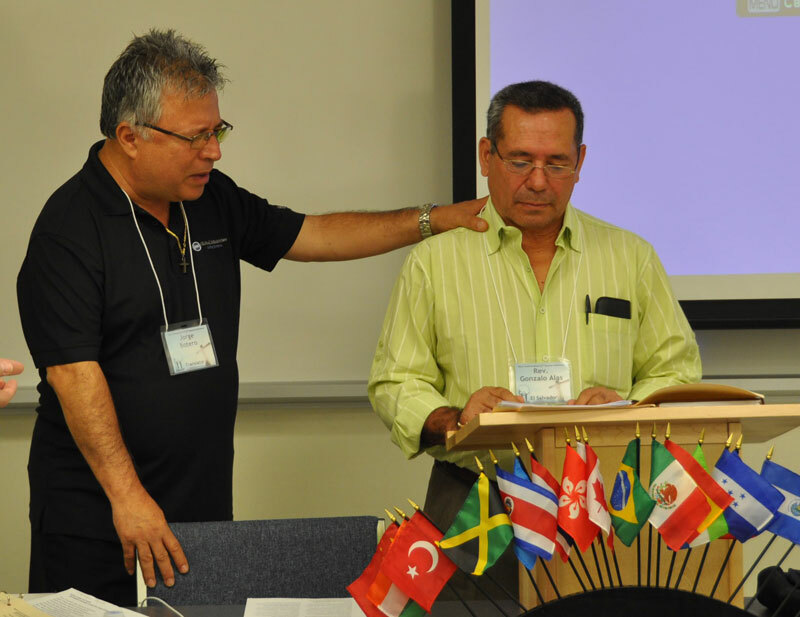 Interpreter Jorge Botero (left) and Gonzalo Alas, superintendent of the work in El Salvador, during the prayer for the El Salvador churches. The close of the General Conference meeting. The Mill Crossing worship team. 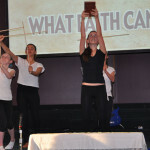 During the Mill Crossing service. 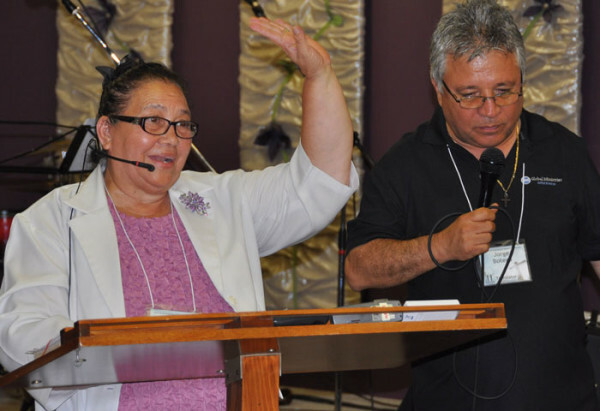 Juanita Chavez, superintendent of Honduras Conference, preached at Mill Crossing. 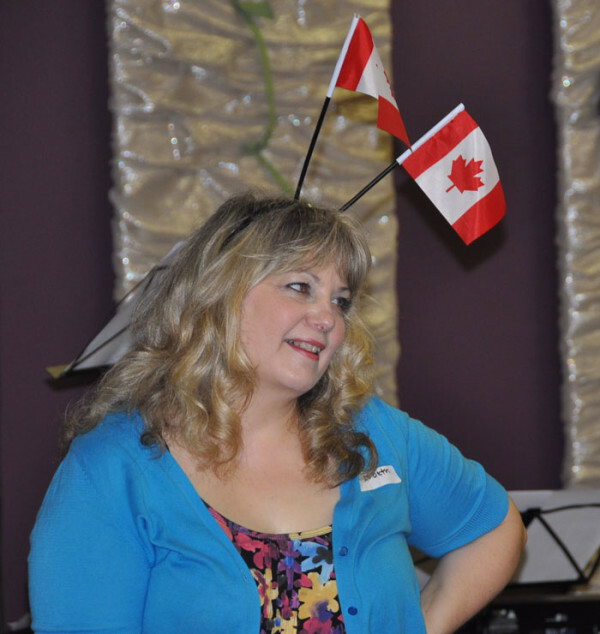 Liz Cudney, co-pastor of Mill Crossing, having some fun. Day 3 of General Conference began with more reports about national conference missions efforts. By noon, they adjourned. Rev. 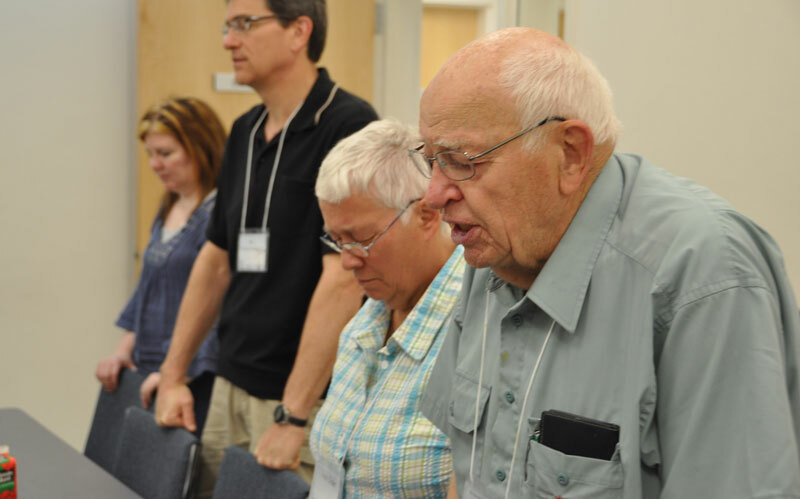 Martin Magnus, a retired minister in Ontario who has been a voting delegate to various General Conferences over the years (and is the father of Canadian bishop Brian Magnus), closed the conference in prayer. The conference then moved into executive session, which consisted of the highest leader from each national conference (in other words, about half of the delegates). After lunch, the delegates took an afternoon excursion to a local Christian media company and then to CH Global, the organization with which we partner in various ways in Jamaica. 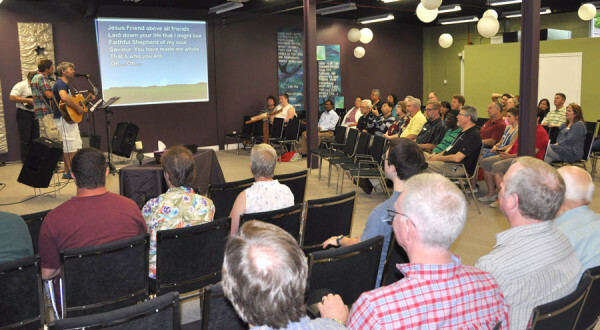 The evening service was held in nearby Cambridge at the Mill Crossing United Brethren church. 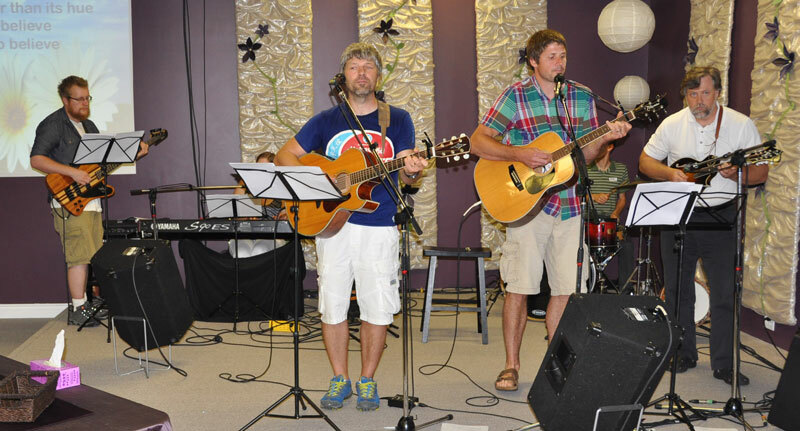 This church began in 2005 as a daughter church of Parkwood Gardens UB church in Guelph. Neil and Liz Cudney co-pastor this church. The beautifully renovated part of an old industrial building. It has the feel of a coffeehouse–very intimate and relaxed. 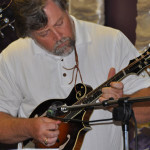 The Mill Crossing music team led in worship, and did so superbly (with Pastor Neil playing mandolin and banjo). 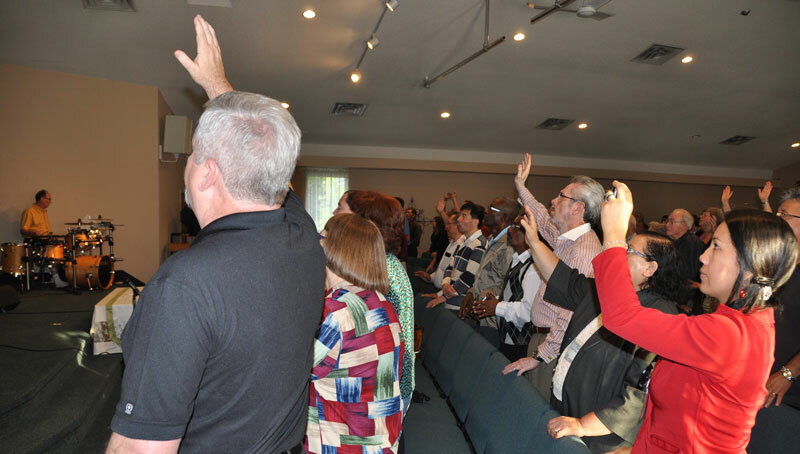 Each of the General Conference delegates were given the chance to introduce themselves and say something to the congregation (which included people from several area United Brethren churches). Then Mill Crossing gave each person a gift, and prayed for them. Juanita Chavez, superintendent of Honduras Conference, preached, with the help of interpreter Jorge Botero. She sang a song in Spanish toward the beginning, and then concluded by leaping into the deep to sing “Shout to the Lord” in English. 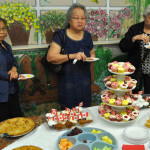 She did well, and was helped by the congregation joining her. Ice cream cake was served afterwards. On Saturday, a missions conference for all of the Canadian UB churches will be held in the morning and afternoon at Stanley Park UB church in Kitchener. Most of the General Conference delegates will have the chance to speak. Should be a fun day. Martin Magnus praying to close the 51st General Conference. Jeff Bleijerveld and Yiu Kin Keung heading off on the afternoon excursion. 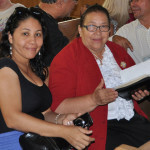 Damaris Canales of Honduras (with Jorge Botero) brought greetings to the Mill Crossing congregation in English. Gonzalo Alas accepting a gift from the Mill Crossing congregation. 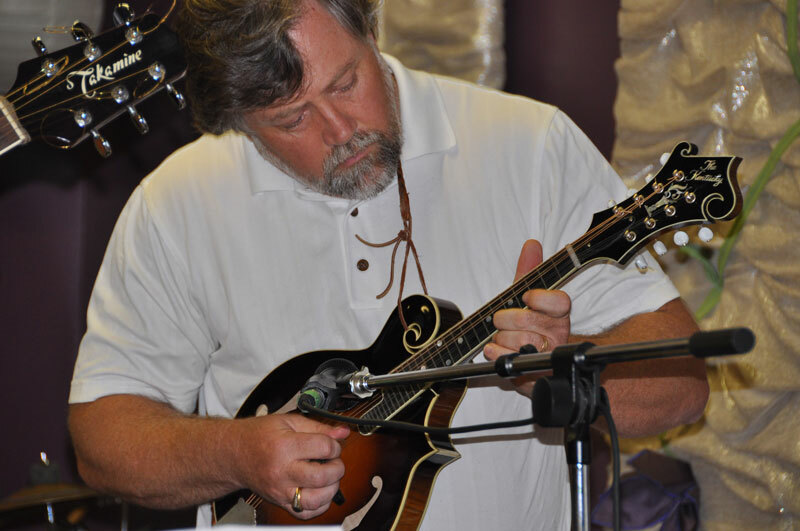 Neil Cudney, co-pastor of Mill Crossing, on the mandolin. Hands around the sanctuary at the conclusion of the service. We’re on the verge of passing the 700 mark in registrations for this summer’s US National Conference. We’re at 692 registrations, of which 128 are children and youth. Bishop Phil Whipple reporting on the work of the US National Conference. 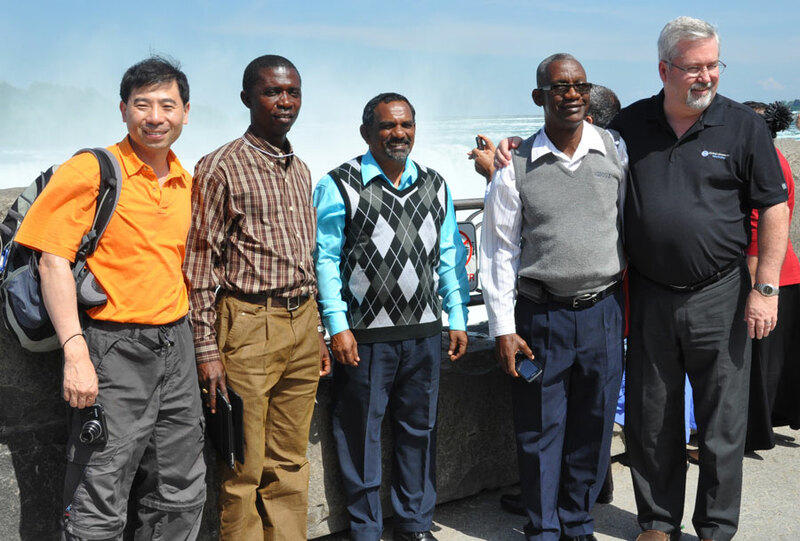 At the falls (l-r): Daniel Ko (Hong Kong), John Pessima (Sierra Leone), Winston Smith (Jamaica), Isaac Nugent (Jamaica), Phil Whipple (USA). Bishop Brian Magnus with delegates at the front of the Grace church. Denis Casco (right) and his translator, Jorge. How the cluster system has evolved since being instituted in 2005. US church plants (he mentioned 7 churches). Leadership development effort – the UB history course, other courses, and summits for youth, worship ministers, and associate passtors. The 26 proposals for revising the Discipline, coming before this summer’s national conference. Brian Magnus, chairman of the General Conference, then led the delegates in discussing the only major decision to come before the delegates. It involved the UB National Conference in the Philippines. Unanimous action was taken. More will be said about this later. Brian Magnus then turned to national conference reports about mission efforts. Canada and Honduras reported on what they were doing. Rev. Oliam Richard, superintendent of the UB churches in Haiti, had arrived the night before. 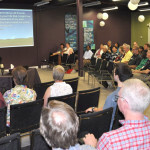 He told about the work in Haiti as part of the report of Canada, which oversees the Haiti mission district. Honduras also reported. And then it was time for lunch. After lunch, the delegates climbed aboard a luxury tour bus and headed to Niagara Fall, about two hours away. The foreign visitors could not be allowed to get this close to the falls, one of North America’s premier natural wonders, and not see it. The trip included a ride aboard the Maid of the Mist, a boat which approaches very close to the Canadian horseshoe falls. The wind and dense spray left everyone quite wet. Four of the UB churches in Canada are in the Niagara area (or at least on that end of Ontario). 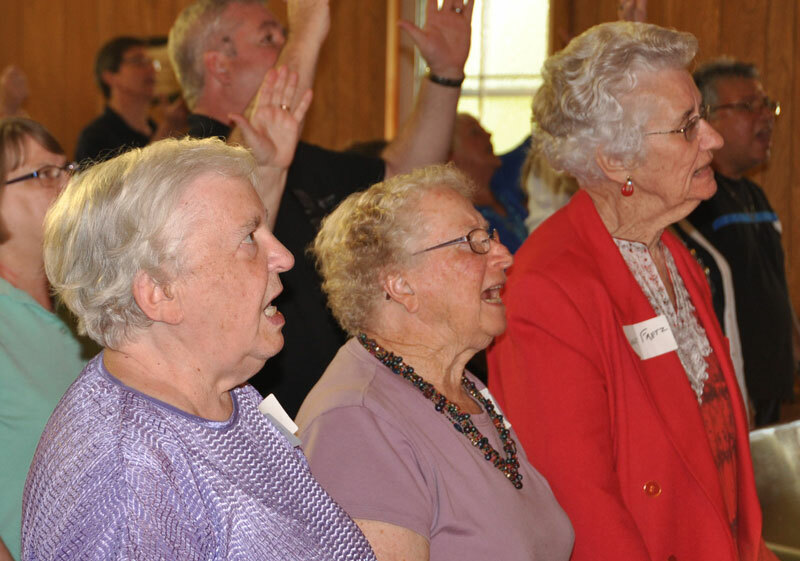 The bus took everyone to the Grace UB church in Sherkston, where a delicious meal awaited. Then the evening service was held there. Persons came from all four of the nearby churches. 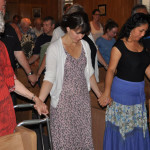 Grace has been a strong missions-minded church over the years, producing a number of missionaries (Olive Weaver, Shirley Fretz, Ruth Benner, and others) and faithfully supporting the work of United Brethren missions. In that respect, Grace has few peers in the denomination. 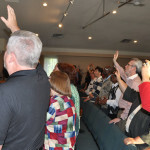 Pastor Dan Nickless said they view themselves as a sending church, having raised up so many missionaries and pastors since the church began in 1897. 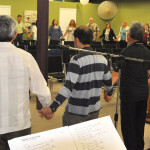 The Grace worship team led the congregation in singing a number of the great hymns–“Amazing Grace,” “It is Well,” and others. As he did the previous night in Guelph, Bishop Magnus introduced all of the General Conference delegates, bringing them to the platform for everyone to see. The Grace missions team then joined them and prayed over the delegates. 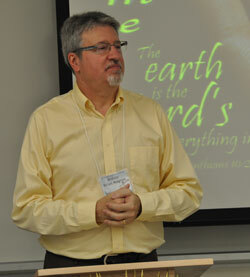 Denis Casco, bishop of the Mexico National Conference, spoke. The conference’s intrepid translator, Jorge, got quite a workout. Denis and Jorge are both kidders, with wonderful senses of humor, and they are probably not good for each other. Denis switched back and forth between English and Spanish, seemingly trying to catch him off guard, and the audience loved it. 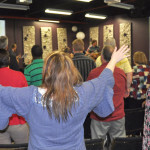 A lot of laughter occurred during this service. But it was also a powerful message. Bishop Casco spoke on the simple topic of “Love,” which he had found to be one of the most difficult topics to preach on. 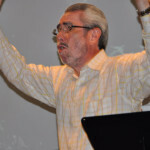 Throughout the message he referenced Archie Cameron, a Canadian whose love for a distant people caused him to spend his life in Honduras, where his influence led numerous people to Christ–including Denis Casco himself. After the service, the delegates boarded the bus for the trip back to Kitcheer, arriving at Emmanuel Bible College around 11 pm. It was a long day, but a good one. 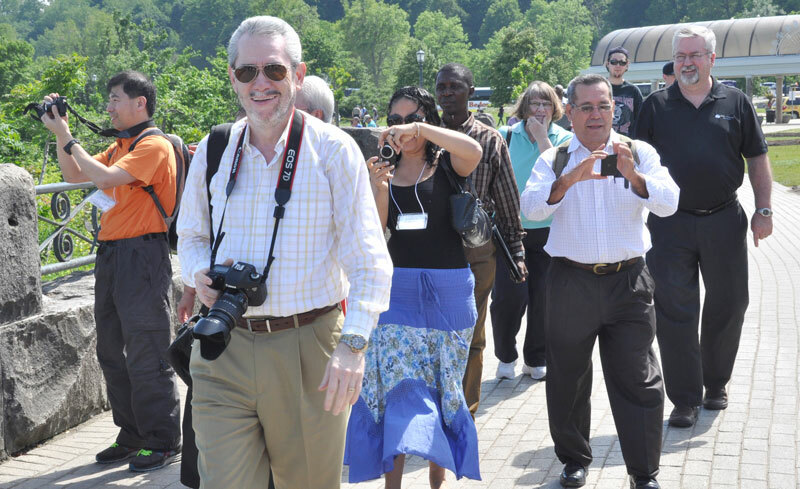 At Niagara Falls: everyone has a camera out. 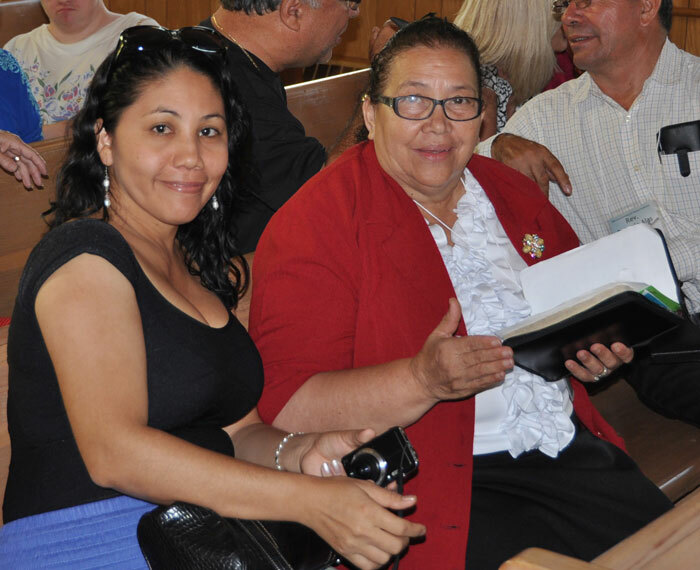 Honduran delegates Damaris Canales (left) and Superintendent Juanita Chavez. 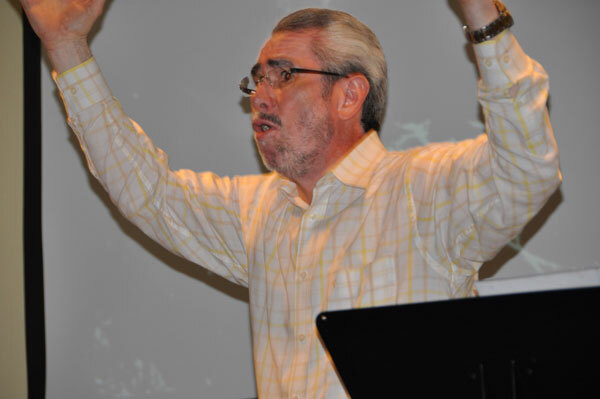 Denis Casco preaching at Grace UB church in Sherkston, Ontario. 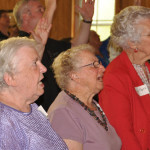 Three former Sierra Leone missionaries at Grace church (l-r): Audrey Federlein, Kathy Jones, and Shirley Fretz. Everyone at Grace held hands to conclude the service. Bishop Brian Magnus introducing the General Conference delegates. 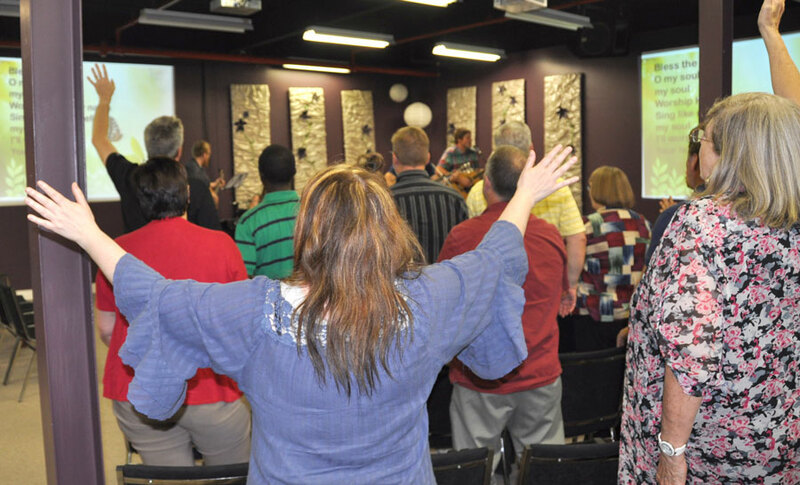 It was a packed house on Wednesday night at Parkwood Gardens church. 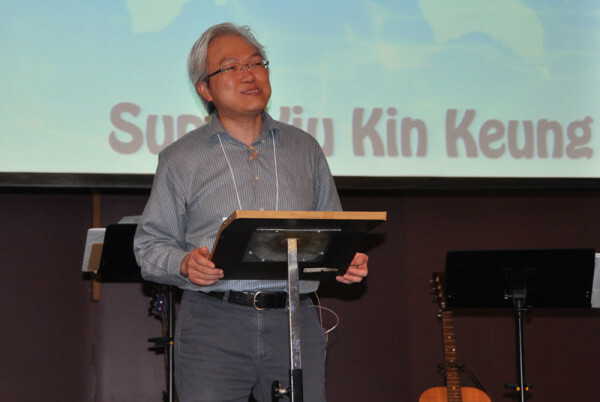 Yiu Kin Keung, superintendent of Hong Kong Conference, preached on Wednesday night of General Conference. Day 1 of General Conference including hearing reports from every national conference except for the United States (they went in alphabetical order; the US will begin the day o Thursday). In the afternoon, the delegates took an excursion to Doon Village, an old village in Kitchener. 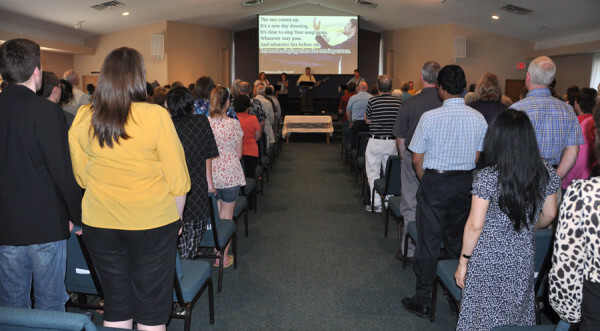 The day ended with a worship service at Parkwood Gardens UB church in Guelph, Ontario. This is the church pastored by Brian Magnus, bishop of the UB Church in Canada. The Parkwood Gardens worship team (with Bishop Magnus playing bass and his wife, Lynette, singing) led the crowd through a number of worship songs. Bishop Magnus introduced all of the international delegates and guests, bringing them to the platform and having prayer for them. 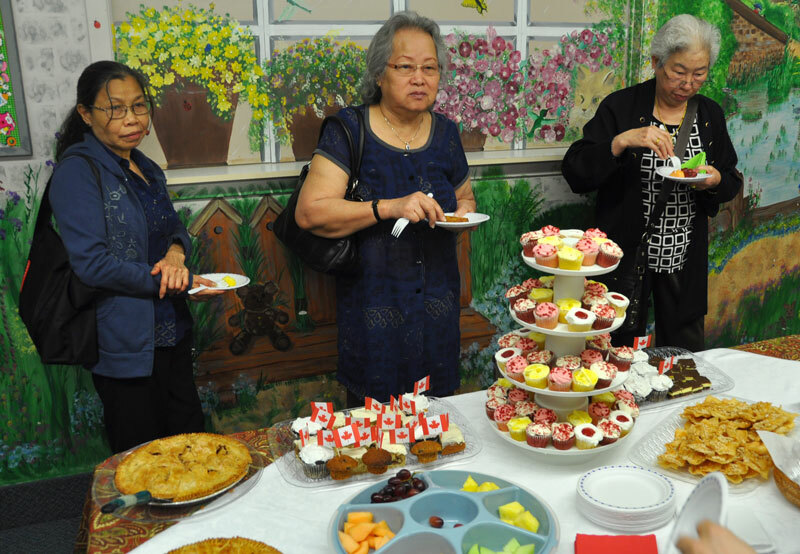 A Vietnamese congregation started at Parkwood Gardens at the end of 2012. A number of them were present, and they were recognized. 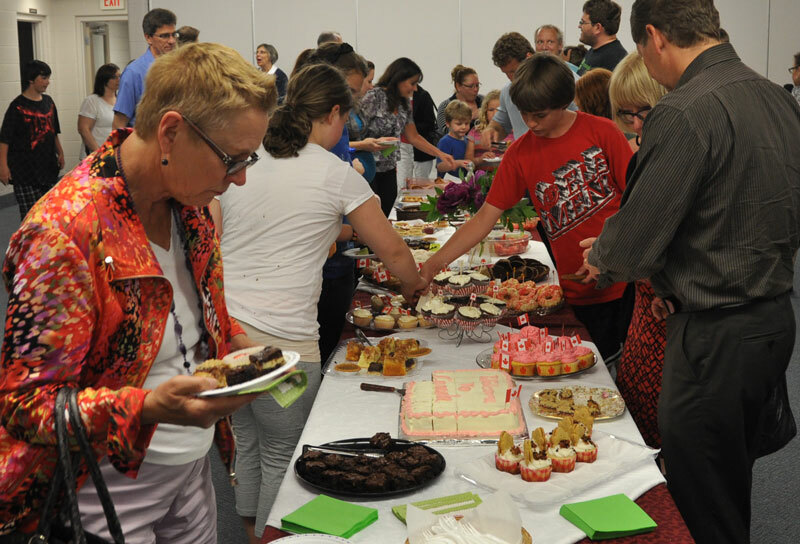 A dessert reception was held after the service in the downstairs fellowship hall, with way too much sugar present. The Vietnamese congregation had their own table of goodies, including some amazing egg rolls. General Conference delegates participating in the music. 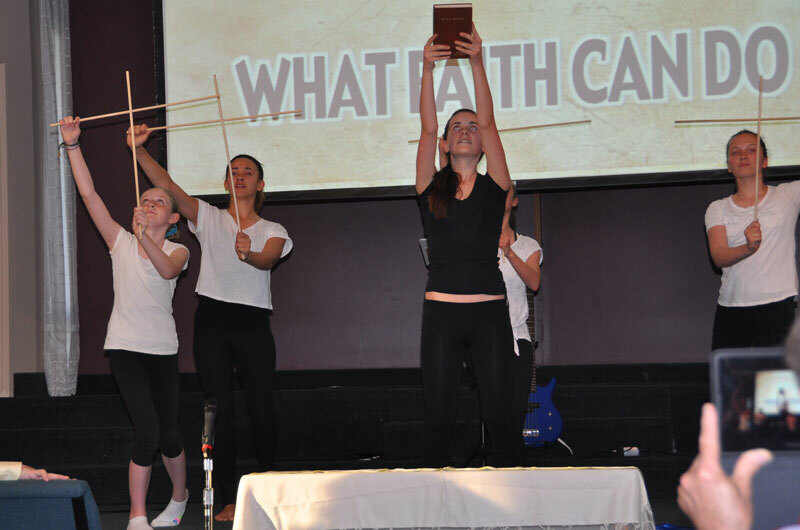 A teen drama group from Parkwood Gardens gave a dramatic presentation. 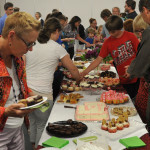 At the dessert reception after the service. Brian Magnus opening the General Conference meeting. 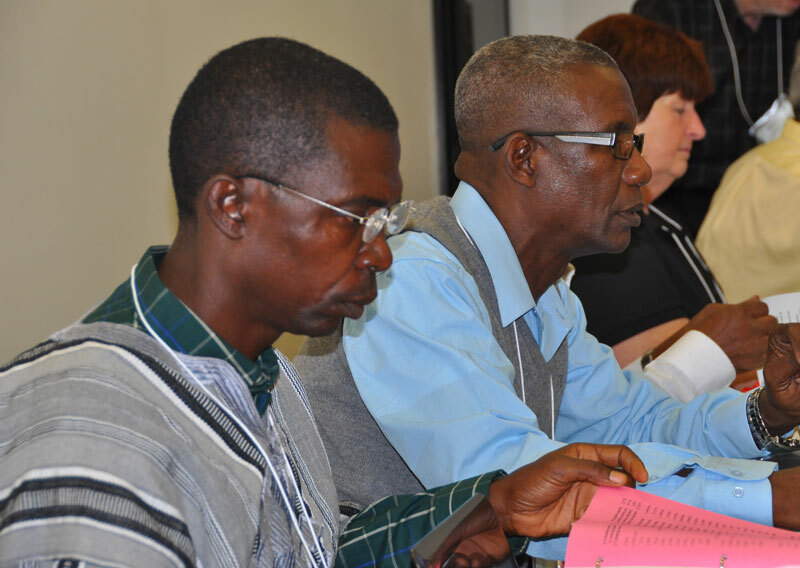 Bishops John Pessima (Sierra Leone, left) and Isaac Nugent (Jamaica). The 2013 General Conference got underway at 9 am Wednesday, May 29, at Emmanuel Bible College in Kitchener, Ontario. General Conference is an international meeting held every three years. Each national conference can send two delegates. Seven of the ten national conferences are represented. United States (Bishop Phil Whipple and Jeff Bleijerveld are the delegates). 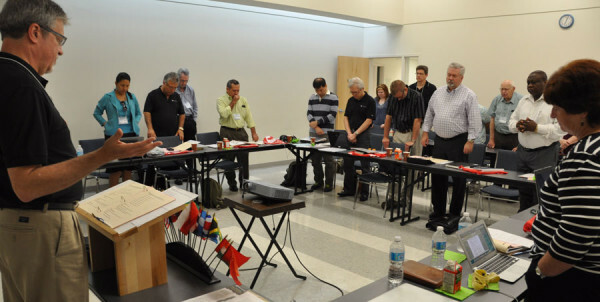 Canada (Bishop Brian Magnus and Paul Plato, a layperson, are the delegates). Hong Kong (Superintendent Yiu Kin Keung and Mr. Daniel Ko). Sierra Leone (Bishop John Pessima). Three national conferences are not attending: Nicaragua, the Guatemala, and the Philippines. Donna Hollopeter, associate director of Global Ministries, is serving as secretary. Rev. 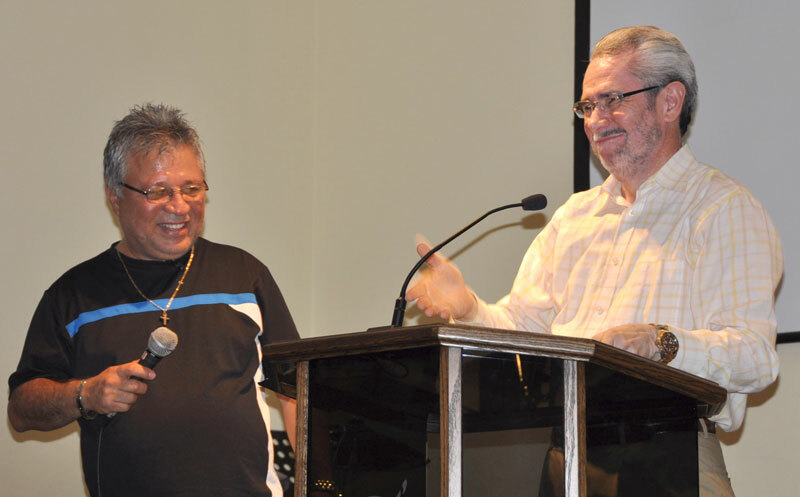 Gonzalo Alas, a Honduras pastor now serving in El Salvador and overseeing the churches there. Rev. Oliam Richard, superintendent of the UB churches in Haiti. He won’t arrive until Wednesday night (a plane crash at the Port Au Prince airport in Haiti threw everything off and caused his delay). Rev. Alas’s visa was initially rejected by the Canadian embassy, but Brian Magnus’s Parliamentary representative stepped in and got him cleared. The delegates from Nicaragua, Guatemala, and Costa Rica were not so fortunate–either they were denied entry visas, or they started the process too late. 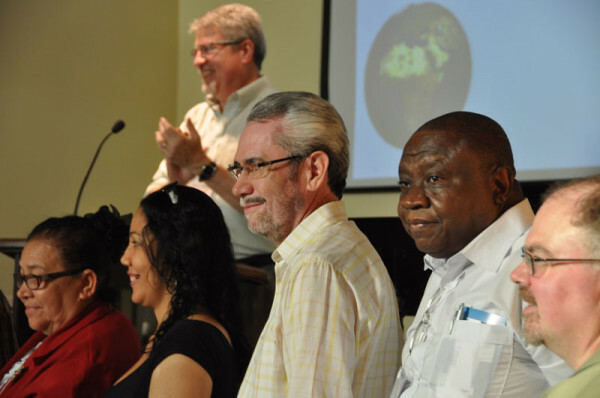 Bishop Brian Magnus of Canada is chairman of the international executive committee, a position to which he was elected in 2001 when the United Brethren denomination first reorganized with an international structure. He is chairing the General Conference, as he did in 2005 (in Huntington, Ind.) and in 2010 (in Honduras). Mornings: business sessions of the General Conference. Afternoons: an excursion of some kind (Thursday is Niagara Falls). 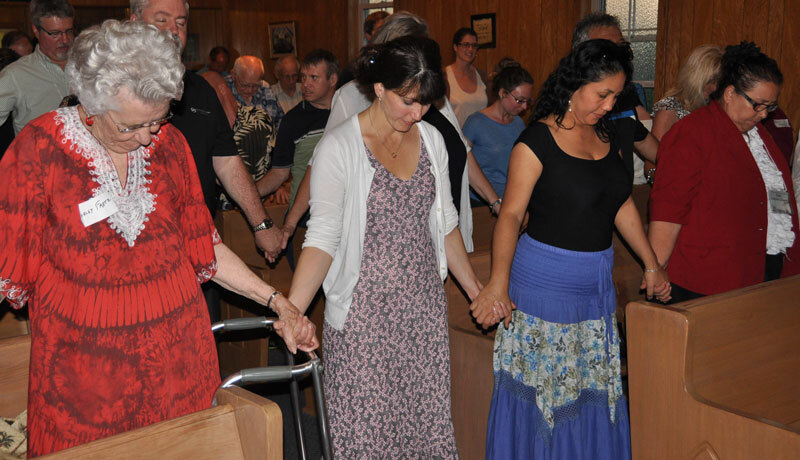 Evenings: a service in one of the Canadian UB churches. 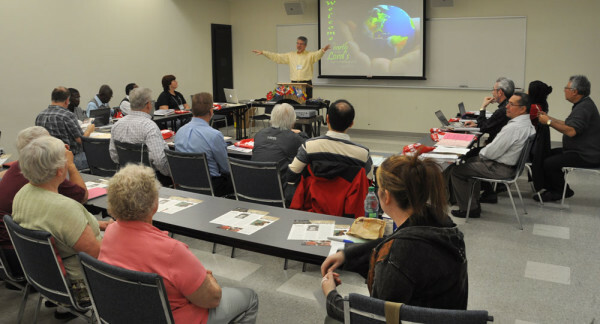 Saturday: a big missions conference for the UB churches in Canada. 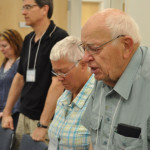 Sunday: delegates will be dispersed to speak in various Canadian UB churches. National conference reports and updates (15-20 minutes per country). National conference mission efforts reports (outreach efforts within and outside of their own borders). Approval of any changes made to national conference governing document. This is mostly an accountability check to make sure national conferences haven’t taken actions which might violate the international Confession of Faith, Core Values, Constitution, and By-Laws. Jill Van Deusen (right), 70, a former missionary in Sierra Leone, passed away on Thursday, May 23, at the University of Toledo Medical Center. Jill, a native of Hillsdale, Mich., served as a teacher in Sierra Leone for nine years. After returning from Sierra Leone, she worked two years in Washington DC with Angel Tree Prison Fellowship, and then moved to Archbold, Ohio, where she taught school at Four County Career Center, near Archbold, and also worked at the Archbold Library. She was a member of the Archbold Evangelical Church. Both the visitation and funeral will be held on Tuesday, May 28, at Archbold Evangelical Church, 705 Lafayette Street, Archbold, Ohio 43502. Visitation time: 11 am – 1 pm Tueday, May 28. Funeral time: 1 pm Tuesday, May 28. 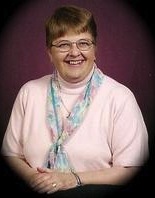 Jill’s online obituary is with the Grisier Funeral Home in Archobold. Jill Van Deusen almost died in Africa. One morning in August 1979, Jill woke up almost completely paralyzed. Her condition was quickly diagnosed as Guillain-Barre Syndrome, a rare disease of the spinal cord. She was quickly evacuated to the Netherlands, accompanied by Dr. Ron Baker and Sharon Birdsall (now Sharon Cherry). She gradually recovered, and returned to the United States on October 3, 1979. Jill later bravely returned to Sierra Leone to continue serving, but her body just couldn’t handle it, and her term was cut short. You can read online the entire story of her illness and the emergency evacuation. Jill Van Deusen, 70, a former missionary in Sierra Leone, passed away on Thursday, May 23, 2013, at the University of Toledo Medical Center. Jill, a native of Hillsdale, Mich., served as a teacher in Sierra Leone for nine years. After returning from Sierra Leone, Jill worked two years in Washington DC with Angel Tree Prison Fellowship, and then moved to Archbold, Ohio, where she taught school at Four County Career Center, near Archbold, and also worked at the Archbold Library. She was a member of the Archbold Evangelical Church. Jill Van Deusen almost died in Africa, back in August 1979. Here is that story. On Tuesday afternoon, August 21, 1979, Jill Van Deusen told Dr. Ron Baker that she had experienced weakness in her right hand since that morning. The next morning, Jill couldn’t get out of bed; she was almost completely paralyzed. The quick paralysis shocked Dr. Baker, and he wondered what they could do in a minimally equipped bush hospital. How would they keep her breathing if her respiratory muscles became paralyzed? If they tried to evacuate her from the country, could she survive the trip? He consulted, by radio, doctors in Freetown and at the Wesleyan hospital at Kamakwie, and a doctor from the Catholic hospital in Serabu came to Mattru. They all agreed that Jill probably had Guillain-Barre Syndrom, a rare disease of the spinal cord, and that she needed to leave for Freetown right away. All the missionaries pitched in. Judy Hoath ran the outpatient clinic. Sharon Frank took the Catholic doctor back to Serabu. Sharon Birdsall gathered the necessary drugs and medical equipment. Dennis Burkholder and Scott Taylor ran lab tests on Jill. Tina Wilkins helped care for Jill. Phil Fiedler made last-minute mechanical repairs on the hospital van for the trip. Cathy Jordan packed Jill’s things, and Jane Baker packed for Ron. Throughout the day, many Africans came to show their concern. They removed the middle seat from the hospital van to accommodate a stretcher. Then, after a prayer time, Dr. Baker and Sharon Birdsall, along with an African driver, began the long journey to Freetown. Cathy Jordan and another African, Joseph Jaiah, followed behind in a Suzuki jeep. The bumpy dirt road jostled the stretcher, so they stopped several times to readjust it. After two-and-a-half hours, they arrived in Bumpe, where Jerry Datema and June Brown were waiting. June Brown brought another blanket, Jerry Datema offered a prayer, and they continued the remaining 150 miles to Freetown. They arrived at Connaught Government Hospital in Freetown at 1:30 Thursday morning. Jill was doing well, but was glad the trip was over. On September 2, 1981, Bishop Clarence Kopp, Jr., had a unique encounter at a restaurant in Huntington, Ind. He met a man he had nudged toward the Lord 20 years before, when he was pastoring Prescott Avenue UB church in Dayton, Ohio. It was a home visit during a conference evangelism workshop. As Kopp explained the Four Spiritual Laws to this man, fellow minister Rev. Howard Anderson held the man’s baby daughter in his lap. The man didn’t want to accept Christ then, so Kopp left him a piece of paper on which he had written out the Four Spiritual Laws. The man kept the paper and reread it almost daily. Finally, he did become a Christian. What was he doing in Huntington, 20 years later? He was bringing his daughter to Huntington University. The girl’s name was Patti Stone. 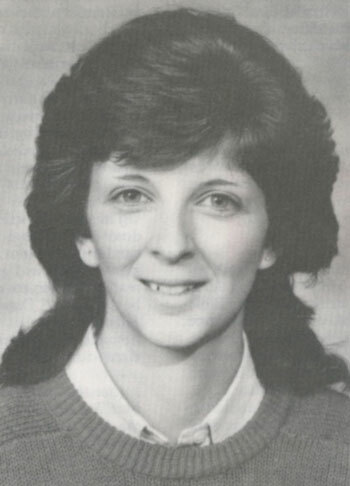 Patti started her college education at Huntington University and then transferred to Marion College (now Indiana Wesleyan) in Marion, Ind., to study nursing. Wendy Feusse, who worked at Huntington University, joined a small work crew from the college which traveled to Sierra Leone in January 1985. They were joined by Michelle Becker and Patti Stone, two former Huntington students who were now intern nurses from Marion College. In Freetown, the group went to the beach with some Peace Corps workers. A huge wave hit the raft Wendy was using, and she found herself floating facedown, paralyzed, unable to move. Patti saved her life that day. But that was only the beginning of what Patti did for Wendy. 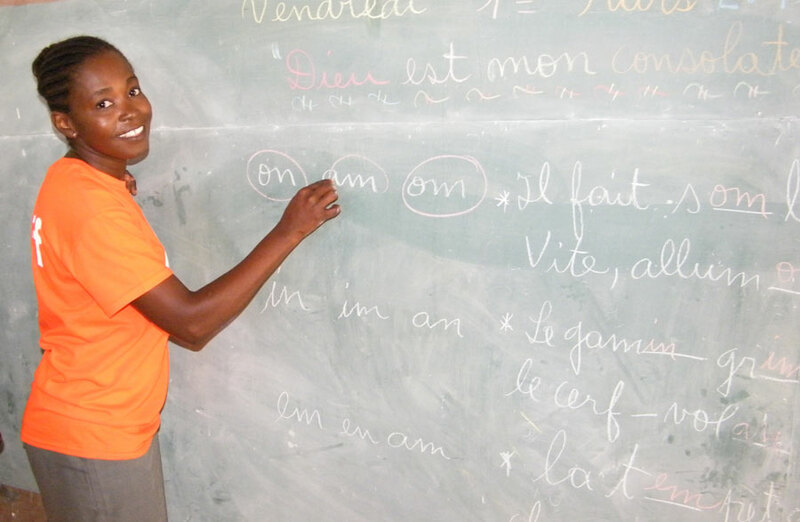 Rosemond has been teaching for 10 years and currently teaches grade 6 at the school in Delmas 33, one of the United Brethren churches in Haiti. He wanted to be a teacher from a young age. He loves the children and especially enjoys teaching them history. Rosemond and his family lived in a rural village when he was a child. He was able to attend elementary school at an unaccredited church school because it was supported by the church and those outside the community. 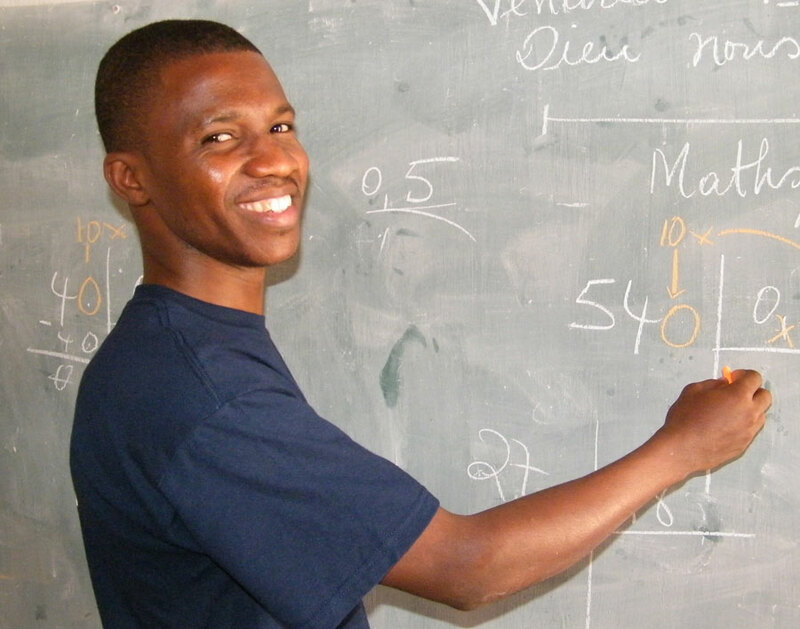 As a result of being given this chance and exceling in school, his family moved in to the city of Port-au-Prince so he could attend high school. He then went on to get his teaching qualifications so that he could give an even better standard of teaching than the one he had received. 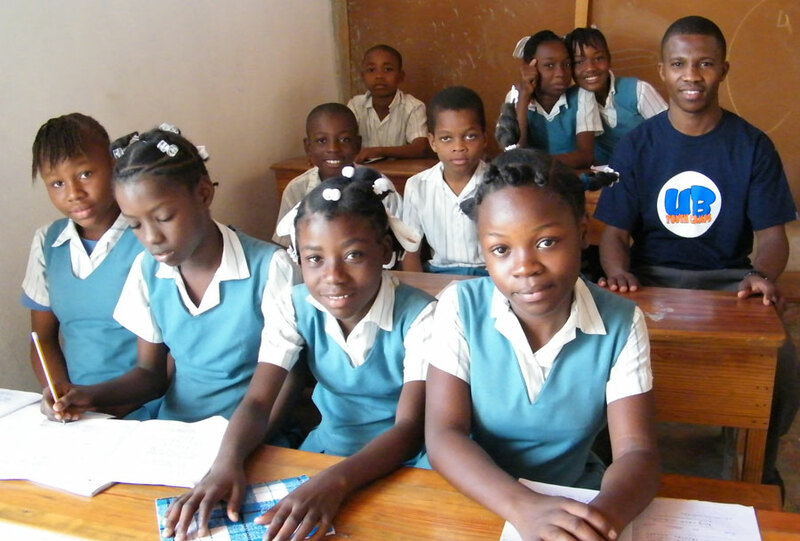 “Haiti needs schools,” Rosemond says. He likes to “bring my contribution to the children’s lives” so that they can “bring their contribution to Haiti as adults.” He is very glad to bring education and God’s love to children, since it meant so much to him at that age. He is grateful that school gave him a chance at a better life. Pauline also enjoyed school growing up and went on to become a qualified teacher. As a child, she attended a quality private school because of the support she received through a child sponsorship program. She is so thankful for the sponsor who gave her that opportunity. Education is investing in the next generation. Both Rosemond and Pauline were given roads to a better future through the educational opportunities they were given. The Delmas 33 school is the result of a partnership between the United Brethren in Christ Church in Haiti and Christian Horizons Global. Together we are able to provide the opportunity for children to learn in an environment where they are also shown God’s love through teachers that love them. 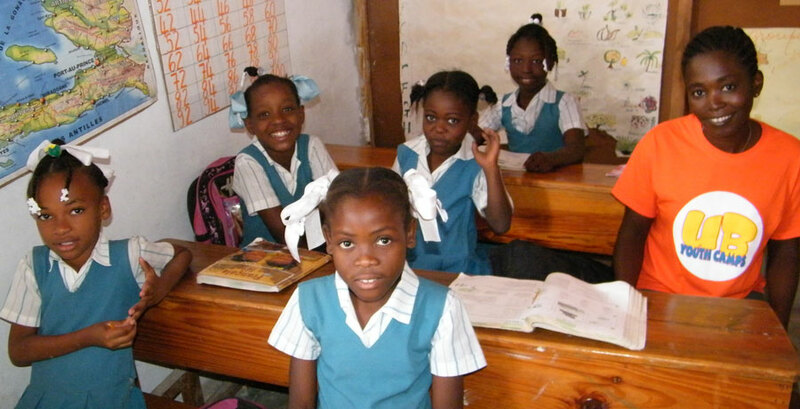 One way or another, children are Haiti’s future. It is our hope that they grow secure in God’s love and with the skills they need to make that future bright. We have four United Brethren schools in Haiti. Currently, 194 children are sponsored and another 151 children are on a waiting list (128 children have never been sponsored, and 23 have lost their sponsor and are waiting to be re-sponsored). Provide a special gift to help fund the United Brethren school the children attend. 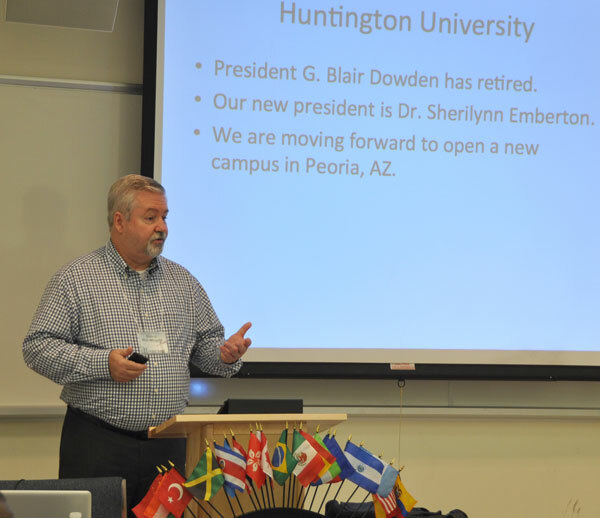 Communications Director Steve Dennie conducted an “exit interview” with Dr. G. Blair Dowden, who at the end of May 2013 concludes 22 years as Huntington University president. Dr. Dowden responded to questions about his early years at HU, student life, changes in the world of academia, the denomination, and his successor, Dr. Sherilyn Emberton. The interview was sent out as an edition of the Connect e-letter. You can also read it online here.